REDP co-developed a 1.8 MW landfill-based PV facility for a Massachusetts municipality located on Cape Cod. The project, which REDP developed with a major national EPC partner, will generate sufficient electricity to offset a large portion of the electrical needs of the Town at a substantial reduction in cost from current retail electricity rates. The project is situated on a closed municipal landfill located adjacent to the Town’s solid waste transfer station. The site is well buffered from residential areas and represents an innovative re-use of land that his little value to the Town in its current condition. The project was designed using a ballasted racking system to preserve and protect the engineered landfill cap. The project also incorporates landfill maintenance and mowing restrictions, as the landfill has been identified as habitat for an endangered ground-nesting bird species. The project includes over 6,000 PV modules arranged in rows over approximately 8 acres of the closed landfill. The row spacing, module height and ballasted racking methodology were all designed to minimize or avoid landfill cap impacts, and to ensure that the grassed surface of the landfill continues to serve its dual function as a stormwater management system and as valuable habitat. 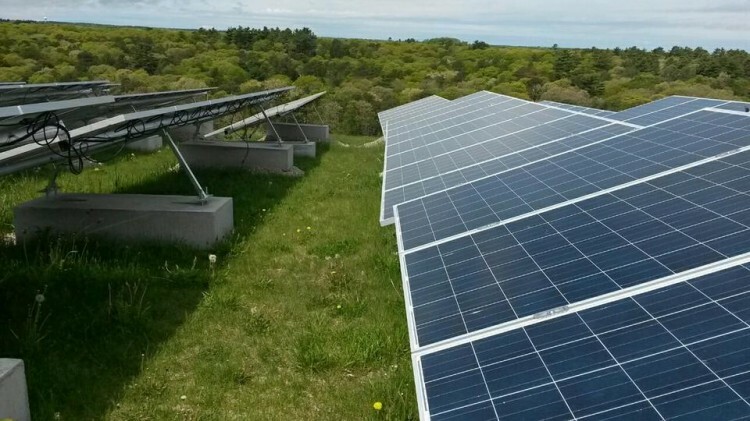 The project is interconnected to the local NSTAR distribution grid in a net metering configuration, and the electricity output is net metered for the benefit of the Town. The project is eligible to participate in the Massachusetts Solar Renewable Portfolio Standard (SREC I), and is expected to generate over 2.2 million kilowatt hours of electricity annually, enough to satisfy the electricity needs of over 300 homes.